Mobile service technicians - Carl Stahl - løftegrej, stålwire, kædesæt, rundsling m.m. 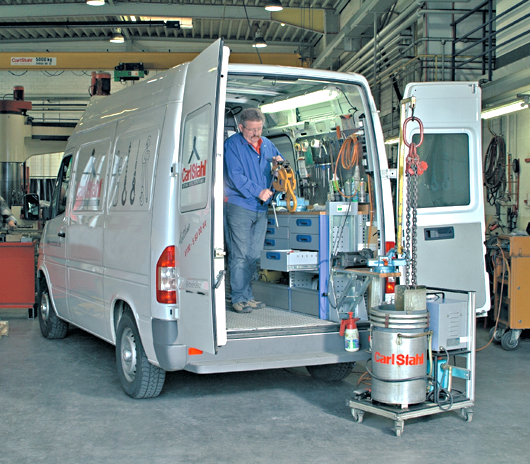 At Carl Stahl A/S we have a large fleet of service vehicles, which provide a fast on-site service regardless of where in the country you are working from. Our service technicians regularly undergo further training and are/will be certified by Kranbranchen, which means that you will always encounter a service technician who is updated with the most recent knowledge about products and the current legislation. Our service technicians offer advice about the proper use of equipment and give their honest and responsible opinion of when your equipment should be replaced due to damage or wear. Contact us by phone at +45 76 24 02 34 or email info@carlstahl.dk to receive further information about how we may assist you.